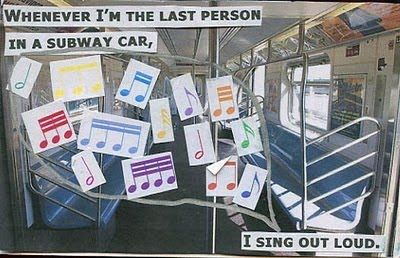 A favorite from the Post Secret blog. If we had a subway system in Chennai, this could have well been my postcard. I have a habit of saving Post Secret images that I strongly relate to, and rather surprisingly or NOT, there are quite a few that I completely identify with. This being one of them. We may not have a subway system (as yet) in the city, but I've sung out loud in almost every empty room that I was sure was empty. From standing in the middle of the school compound, singing off key at six thirty in the morning, to singing my heart heart out on the bike, to singing at work right before I shut the place for the evening. Hey, give me an empty subway car right now, and I bet I can give your cliché karaoke version of "I Will Survive' a run for its money, off-key and all. Oh same here. There are some secrets that makes me think that I myself made them. My represent my thoughts exactly.